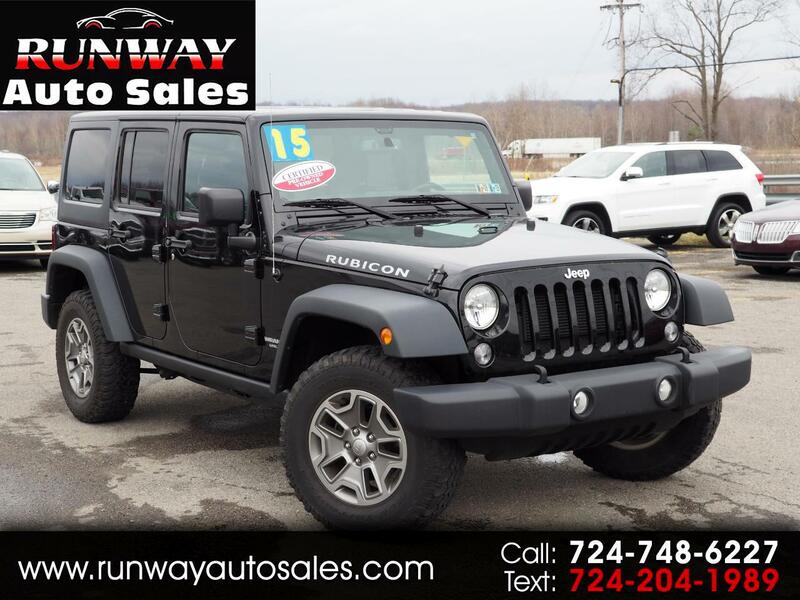 Used 2015 Jeep Wrangler Unlimited 4WD 4dr Rubicon for Sale in Grove City PA 16127 Runway Auto Sales Inc.
WHY ARE OUR PRICES SO LOW. At Runway Auto Sales in Grove City Pa we specialize in Expertly Selected, High Quality pre-owned vehicles. Every vehicle is Fully Serviced and Pa State inspected. WHY ARE OUR PRICES SO LOW? We use the latest technology and do extensive research on each vehicle to offer YOU the best value. Our low overhead saves you even more. CLICK ON THE ORIGINAL WINDOW STICKER. Most of our vehicles are Carfax One Owner, Carfax Accident Free, Recall Free, have Low Mileage and come with balance of Factory Warranty. Our unique Partnership with Carfax has earned us a CARFAX ADVANTAGE DEALER certification. Because we have Lifetime Certified PreOwned vehicles our Banks Lend You More. Most also include a Lifetime Powertrain Warranty at no charge. Extended Warranties are available at a very minimal cost to you. We offer quick on site Local and National Bank Financing from a vast network including most Credit Unions. We have every vehicle clearly priced for your convenience. We Love Trades and will pay cash for your vehicle even if you don't buy a car from us. We are an Esposito Family Dealership that has been in business since 1969 and since then we have acquired over 14 New Car Franchise stores. We are your New Car Alternative. NO Games, NO Gimmicks, Give us a try, we want to earn your trust. WHY BUY FROM US. At Runway Auto Sales in Grove City Pa we specialize in Expertly Selected, High Quality pre-owned vehicles. Every vehicle is Fully Serviced and Pa State inspected. WHY ARE OUR PRICES SO LOW? We use the latest technology and do extensive research on each vehicle to offer YOU the best value. Our low overhead saves you even more. CLICK ON THE ORIGINAL WINDOW STICKER. Most of our vehicles are Carfax One Owner, Carfax Accident Free, Recall Free, have Low Mileage and come with balance of Factory Warranty. Our unique Partnership with Carfax has earned us a CARFAX ADVANTAGE DEALER certification. Because we have Lifetime Certified PreOwned vehicles our Banks Lend You More. Most also include a Lifetime Powertrain Warranty at no charge. Extended Warranties are available at a very minimal cost to you. We offer quick on site Local and National Bank Financing from a vast network including most Credit Unions. We have every vehicle clearly priced for your convenience. We Love Trades and will pay cash for your vehicle even if you don't buy a car from us. We are an Esposito Family Dealership that has been in business since 1969 and since then we have acquired over 14 New Car Franchise stores. We are your New Car Alternative. NO Games, NO Gimmicks, Give us a try, we want to earn your trust. Message: Thought you might be interested in this 2015 Jeep Wrangler Unlimited.